After the popularity of Sussex Tugs at the Chelsea Flower Show, Elizabeth Wright researches their history. Here’s a Sussex trug for you. Steam it gently, soft and warm. And drive in nails, firm and bold. Into the frame fit snug and tight. Though light in weight the willow wood. Queen Victoria loved them, the Queen Mother had a collection of decorated square ones, Prince Charles and gardening Guru Alan Tichmarsh are said to be avid fans. Many enthusiastic English gardeners are likely to have one tucked away in their garden shed as part of their essential equipment. 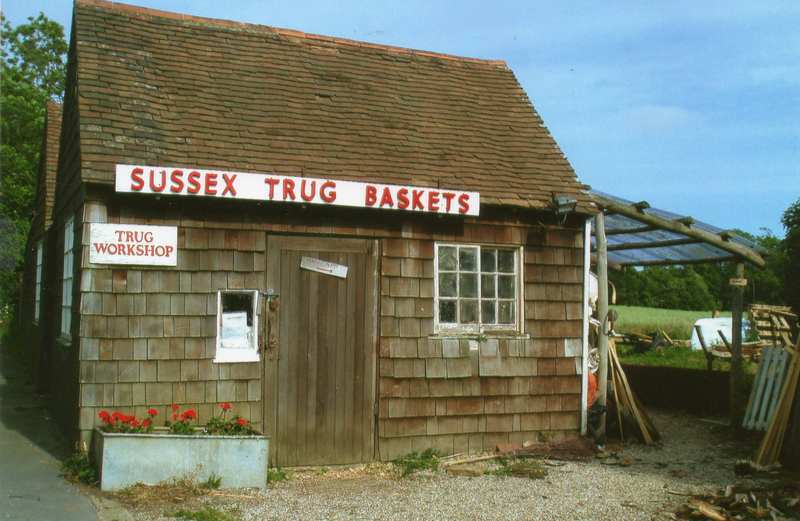 Trugs have world-wide popularity but are mainly produced in East Sussex, with special connections to the village of Herstmonceux. What are they? 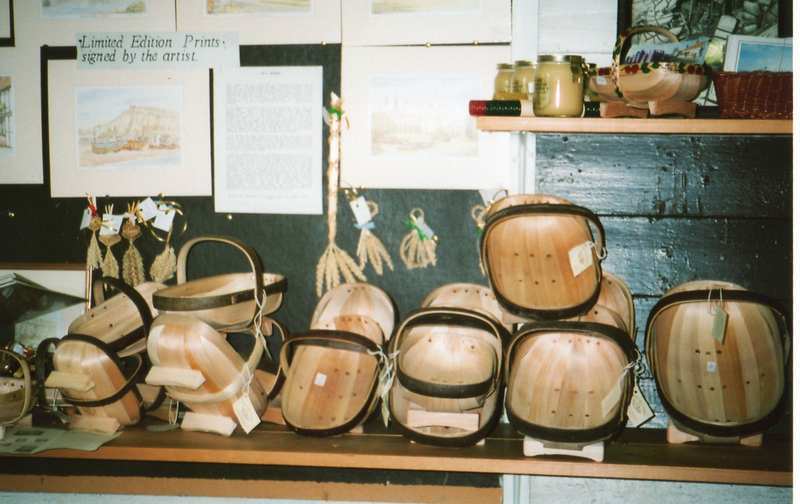 Unique, versatile, slatted wooden baskets known as Sussex trugs, which are still being made by hand in traditional fashion, by skilled craftsmen using natural materials – locally coppiced sweet chestnut and willow woods. Thomas Smith, (1811- 1868) a resident of Herstmonceux village, was making functional round wooden bowls that local farmers could use for baling out animal feed, or measuring and broadcasting grain. But after a visit to the Chelsea Flower Show in 1829, he discovered another, more lucrative, market for his product. By making different shapes and sizes, adding handles and small feet, his trugs proved to be ideal for the many ‘pick and carry’ jobs in the garden, allotment or on agricultural land. Encouraged by his wife Ann, who appeared to have the flair for commercial enterprise, Thomas was provided with the impetus to succeed. Queen Victoria was largely responsible for putting trugs on the map. At the Great Exhibition of 1851, held at the Crystal Palace, London, Thomas Smith’s display of hand made baskets caught her attention, and appreciating their usefulness, strength and lightness, she ordered a consignment for the royal gardens. It is rumoured that Thomas painstakingly made every trug himself, decorated them with silver nails, put them in a cart and, accompanied by his brother Stephen, walked some 60 miles to London, to deliver them personally. 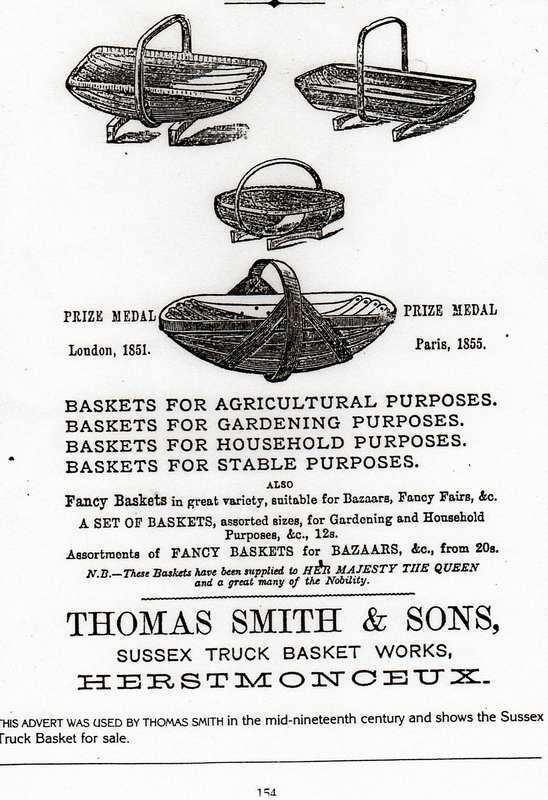 Following this order they received a Royal Warrant and the business name was changed to ‘Royal Sussex Trugs.’ Queen Victoria’s liking for these garden ‘hold-alls’ also gained an order from visiting members of the Russian Imperial family. As a result, the business flourished and the Smiths were soon supplying most European countries. 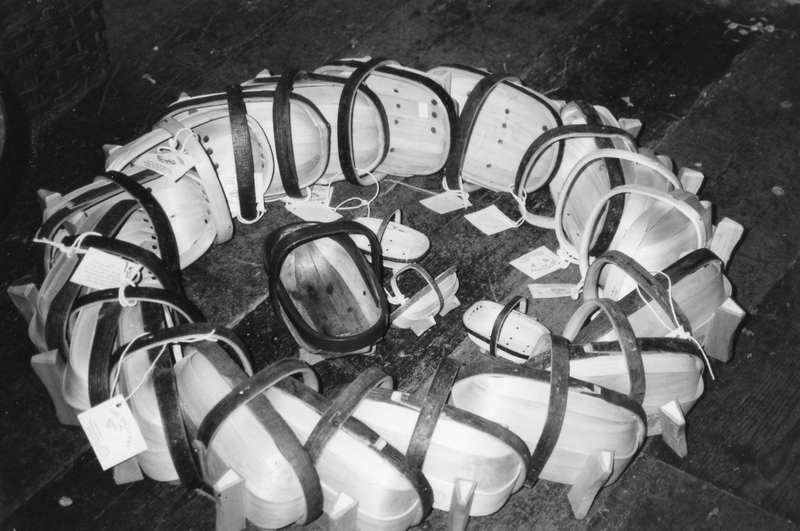 Mollie Reed, (1910-2004) Thomas’ daughter, recalled in her diary that there was an element of small-time, industrial espionage which operated between the highly competitive trug makers. She wrote, ‘My father often used to get up at 4am to sort out the orders ready to send all over the country. Local carriers, ‘Isteds’ would pass by and we would hang out a flag if we needed them to stop and collect these big bundles of trugs, carefully wrapped in brown paper, and transport them to Hailsham railway station. There they were stored with no visible consignee addresses, because rival manufacturers were always ready to poach business and undercut prices. ‘I helped to run the retail shop, which sold a variety of goods, ranging from trugs, tyres, Dicker pottery and bicycles, to pre-packed paraffin and petrol in 2 gallon cans. My brother Rupert refused to have any petrol pumps installed because he said he wouldn’t be able to smoke his pipe out front. We could have sold a lot more bulk paraffin, but Rupert refused to have a tank in the back garden, because he wouldn’t have been able to sit and smoke his pipe out there either! 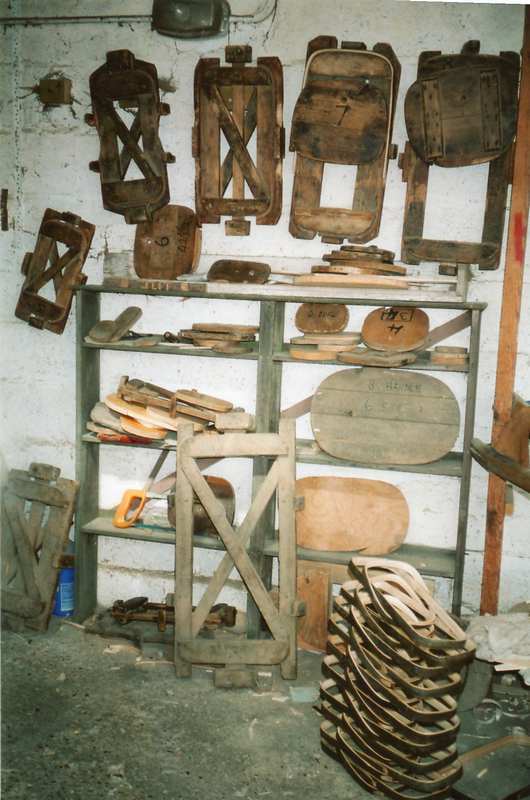 ‘I used to collect up all the waste sawdust in the workshop; some of it was used in the copper on washing day, the rest went to fire up the steamer which was needed in the preparation of chestnut strip for trug frames. 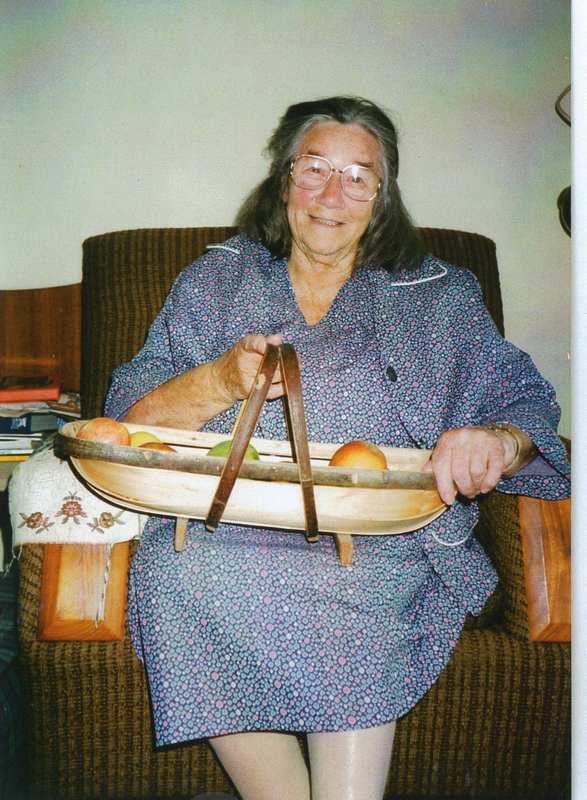 She also recalled an occasion when, ‘One Sunday morning in the 1930’s, a lady came knocking at the shop door wanting to buy two small hand painted trugs. Because it was a Sunday, my mother didn’t want to sell them. The lady pointed to a stationary car along the road and said that she was Nanny to the little princesses, Elizabeth and Margaret- Rose, and they wanted the trugs to play with on Cooden beach. So a sale was made! manufacture, turning out quantities of machine-made plastic trugs. 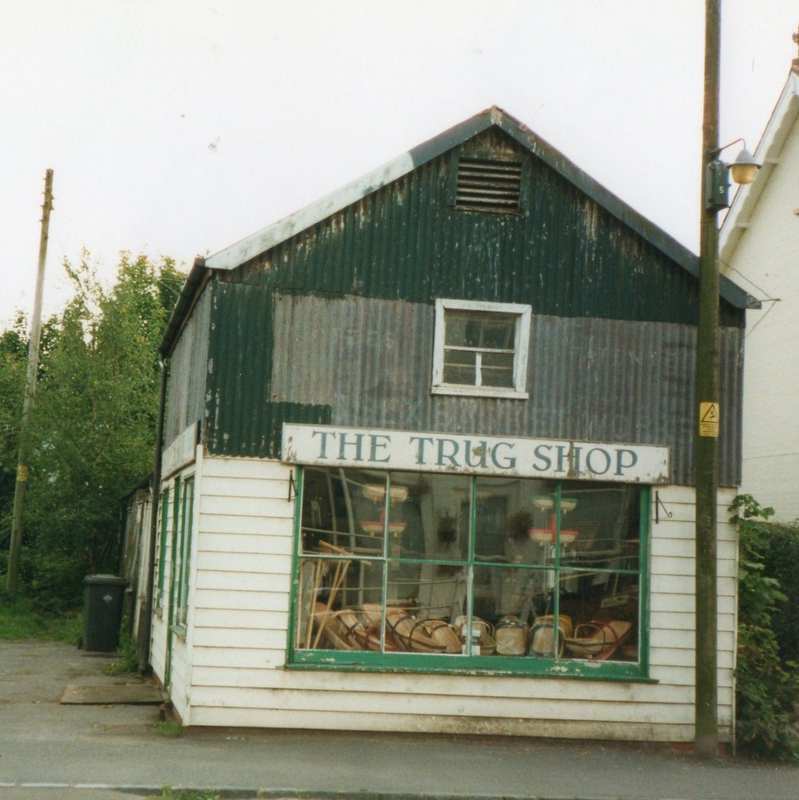 Sarah Page owns ‘The Truggery’ at Coopers Croft, on the A271, near Herstmonceux. The interior of the shop probably looks the same as it did 50 years ago. It is a wonderful muddle of trugs, wicker baskets, corn dollies, and wooden rakes piled high on the floor, rising upwards to meet a mass of conjoined bundles of more trugs hanging from the ceiling. There’s just enough room to get to the counter, where dried flowers, fruit and vegetables are nonchalantly displayed in assorted trugs to give prospective buyers an idea of their various uses. The production line starts in an ancient roadside workshop with an impossibly tall chimney attached on one side. The structure appears to be defying the laws of gravity by staying upright. Even being hit by a skidding Renault Megane in 1998, which left a large gash in the front, still failed to demolish this 250-year-old rustic building. The interior is filled with the tools of the trade; frames and formers hang on hooks. These are templates to ensure the 90 or so varieties of trugs are the correct sizes. Shaved willow boards are piled high, and the floor is covered with the curled-up trimmings of the sweet chestnut lengths. A steamer, which looks like a rusty section of pipe from an abandoned oil rig, and operated by a well-fired pot bellied stove, puffs away in one corner. Music from the local radio station bounces off the rough timbered walls. The main tools to make Sussex trugs are simple….a drawknife…a ‘horse’ (a foot operated vice), an axe, hammer and nails and an old iron! 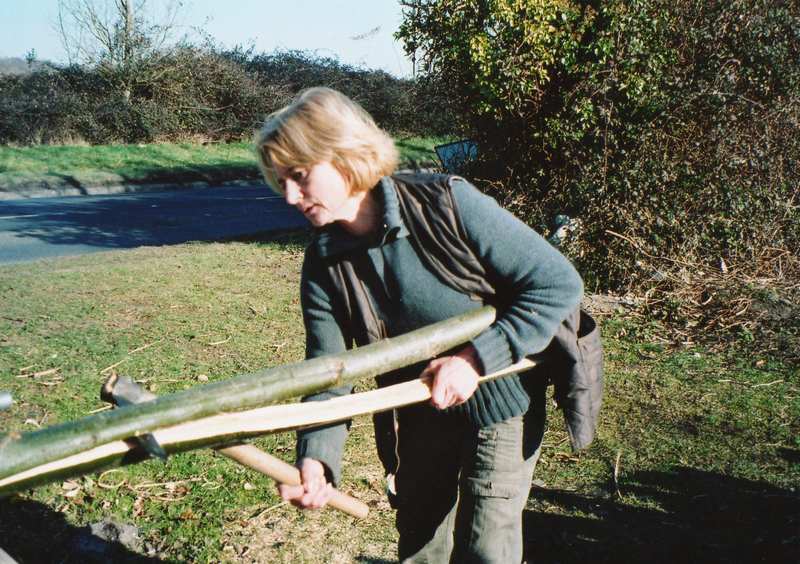 Sweet chestnut is obtained in the winter, from managed woodlands, and the green poles are split in half and stacked outside the workshop to ‘season.’ When ready, they are split again, using a cleaving axe, cut to size, and the outer strips, with the bark intact, are steamed for about 15 minutes. The hot lengths give off a pungent, nutty aroma as they are pulled out and wrapped around the formers. This ensures the sizes are correct and, once cooled, they are removed and made into handles and frames. 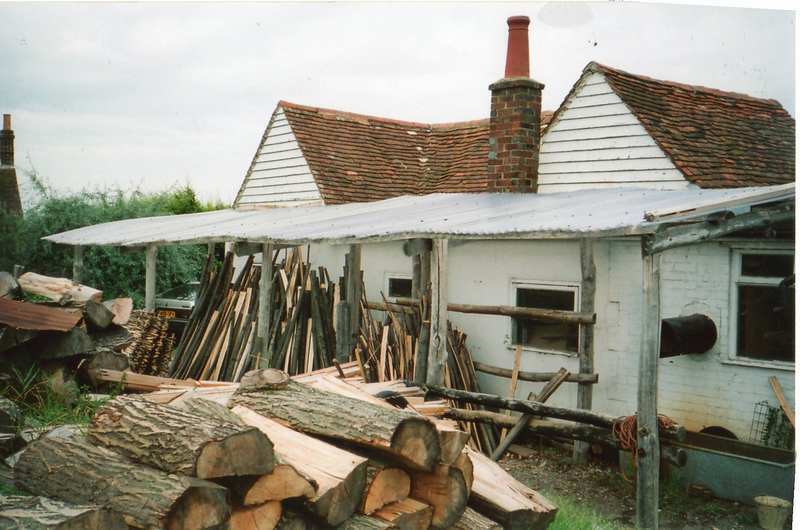 Most of the willow for the panels comes from a Sussex cricket bat maker, and, like the sweet chestnut, is weathered outside, with row upon row, stacked up against the building. When ready, it is cut into thin boards, shaved smooth, shaped and curved with a draw knife. 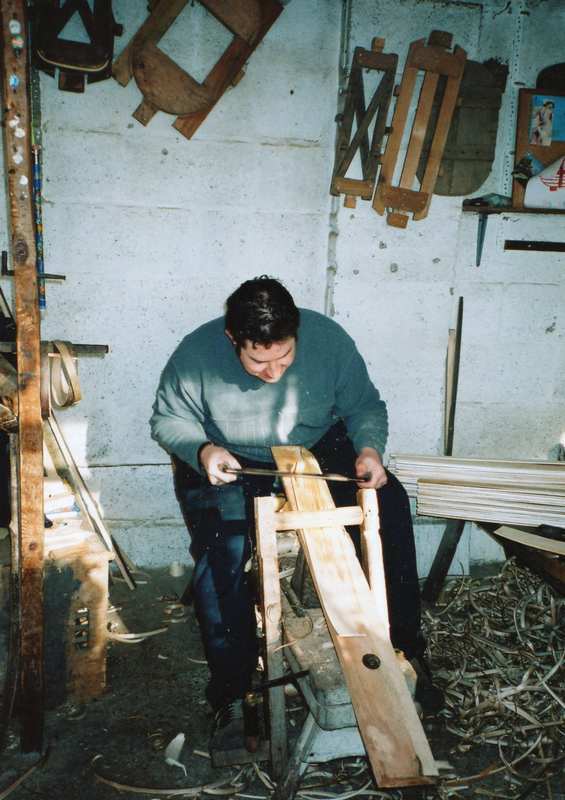 This is done on a special appliance called a ‘dolly’ or ‘shaving horse’, which incorporates a seat for the trug maker and an adjustable foot operated vice to hold the wood steady. 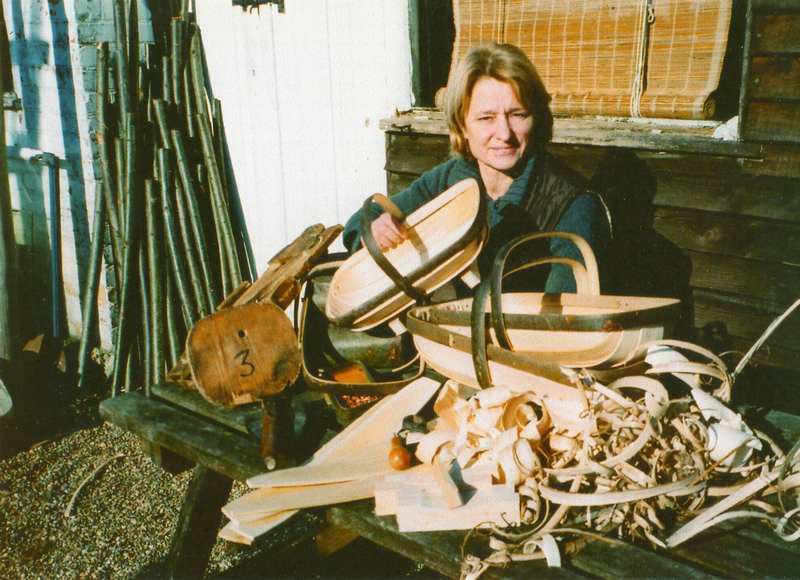 A skilled trugmaker needs a ‘good eye’ to know how to trim each one to the right size, so the requisite number, usually 5 or 7 overlapping boards, will fit exactly, making the basket virtually watertight. The woods are secured by hammering in brads (nails), aided by an old, handleless, heavy iron. In this way the brads come through, hit the iron and are turned back into the bark side. Finally, feet are added, and if there is any wobbling, a light whack with a hammer will set things straight. Hand made Sussex trugs cannot be turned out in quantity. For those that appreciate a quality, long-lasting product, put together in traditional fashion by skilled craftsmen, then a ‘proper’ trug,’ from rural Sussex, will always please. The Truggery is on the A271 on the outskirts of Herstmonceux, 9 miles from Eastbourne, and 4 miles from the A22 to London. « Cuba, Birds in Flight. 2016 from February 22nd-26th. Zapate Swamp, Biosphere Reserve.